During the time when the Goddesses were wreaking havoc on the evil Asuras, the 3 main manifestations, Mahakali, Mahalakshmi and Mahasaraswati, pooled their collective strength and sent a divine child to be born in the house of one Ratnakar. She was to uphold righteousness and attain a level of consciousness by which she would merge with Vishnu. While passing through a ravine she shot an arrow into the earth from where water gushed out -- this stream came to be known as Banaganga. Charan Paduka, marked by the imprints of her feet, is the place where she rested. The Goddess then meditated in the cave at Adhkawari. It took Bhairon Nath nine months to locate her, the reason why the cave is known as Garbh Joon. 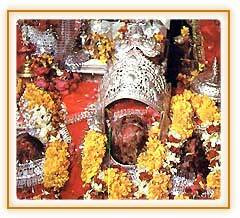 Mata Vaishno Devi blasted an opening at the other end of the cave with Her Trident when Bhairon Nath located her. On arriving at the Holy Cave at Darbar, she assumed the form of Maha Kali and cut off Bhairon Nath's head which was flung up the mountain by the force of the blow and fell at the place where the Bhairon Temple is now located. The boulder at the mouth of the Holy Cave according to the legend is the petrified torso of Bhairon Nath who was granted divine forgiveness by the benevolent Mata in his dying moments. At Darshani Darwaza, 1-km from Katra, the Goddess disappeared. This place is called Darsani Darwaza because the Trikut mountain is visible from here Tikuta Parvat is three high peaks that are the abodes of the Goddess Vaishno Devi. After the Goddess left the Bhumika Temple, she went to the Trikuta Hills passing through here. At this time, Langoor Vir (Veer Langur) felt thirsty. The Goddess shot an arrow into the stone and a holy river was produced, now known as Ban Ganga. It is called Ban Ganga because the Goddess washed her hair at this place. Most pilgrims take bath here. You must show the slip you got near the Bus Stand in Katra to pass this point. Ban Ganga is about 3-km from Katra. This is where the Goddess stopped for some time while Bhairon was chasing her. Her footprints are supposed to be visible on a stone at this place. Charanpaduka means " holy footprints." It is about 1.5-km from Ban Ganga at 3,380 feet. Ardh Kuwari is the halfway point and some pilgrims stay here for the night. There is a 15-foot-long cave called Garbha Joon where the Goddess hid herself for nine months and showed her self to a saint. The cave is narrow, and you have to almost crawl all the way though it. When Bhairon entered the cave, the Goddess made a new opening with her trident and ran away. Ardh Kuwari is 4.5-km from Charan Paduka and 4,800 ft above sea level. After ardh Kuwari the path gets very steep for 2.5-km. This Accent is called Hathi Matha Accent, because the mountain is shaped like the forehead of an Elephant. It is best to use the footpath rather than the stairs, as the climb will be easier. From here it is another 1,500-ft climb to Sanjhi Chatt, and from there another 4-km to the carve. The Sri Ram Temple is near Vaishno Devi cave. There is a Shiva-linga in a cave 125 steps down from the Ram Temple. This temple is about 2.5-km from Vaishno Devi cave at about 6,700 feet. It is traditional to visit this temple after visiting the Vaishno Devi Temple. Bhairon (Bhairav) was absolved of all sins when Durga killed him. When Bhairon was killed by the Goddess his head flew to this place. There is a huge stone outside the cave that represents the body of Bhairon. After he was killed, her prayed to the Goddess to forgive him. It is said that the Goddess gave the benediction that the desires of her devotees who visit this place would be fulfilled.